Is it really possible? 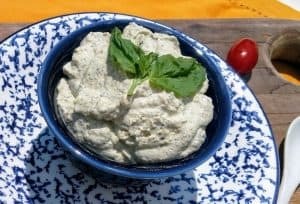 Homemade vegan cashew mozzarella cheese that requires only a handful of ingredients and no oil? 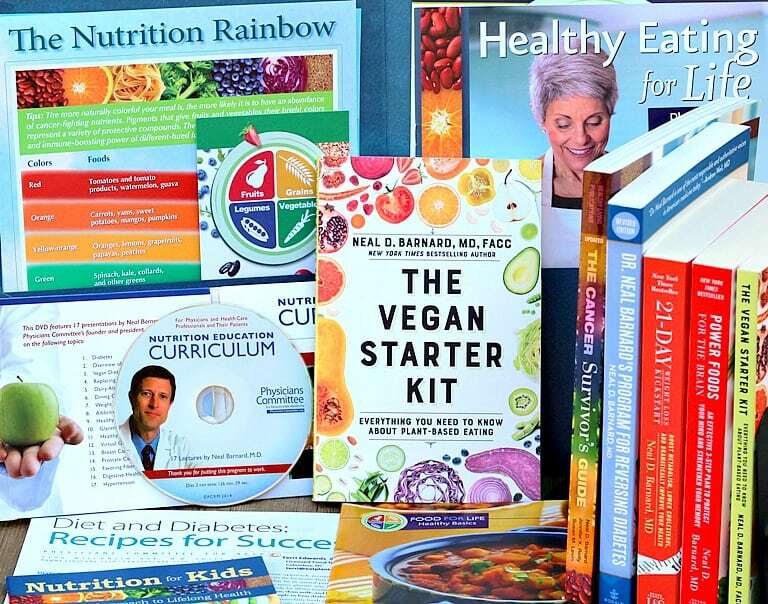 I am so excited to tell you that it IS possible! I even did a happy-dance in my kitchen while testing it out. Regular mozzarella cheese is not dairy-free, because it’s made with milk. However, this vegan cashew mozzarella is! It is made with only five ingredients. 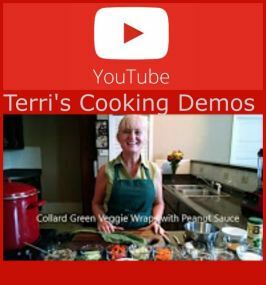 This recipe is fabulous on pizza, lasagna, quesadillas, French Onion Soup, and anything else you can think of. This is a picture of the veggie pizza we made with it. Veggie pizza with cashew mozzarella cheese. 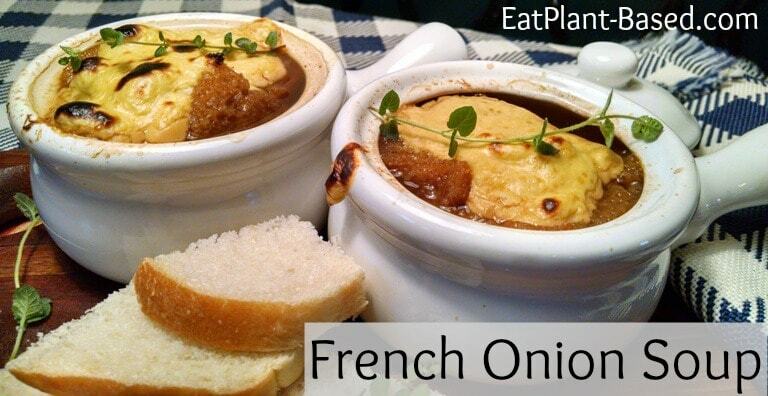 French onion soup topped with mozzarella. 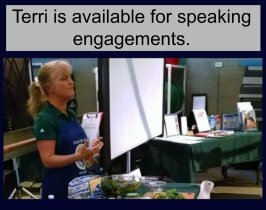 Making your own vegan mozzarella cheese is very simple and SO much better for your health. An ounce of cashews has 4g of protein and 1g of dietary fiber. The same-size serving of cashews also contains about 45mg of phytosterols. 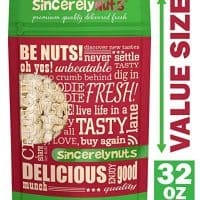 A study, published in the Journal of the American Medical Association in 2002, showed that women who ate nuts were 30 percent less likely to have diabetes than women who didn’t eat nuts. The base of this cheese recipe is soaked cashews. 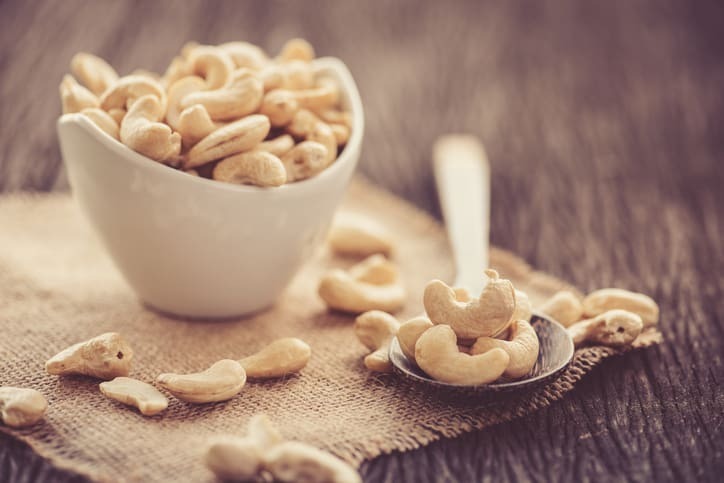 When soaked, the raw cashews create a creamy texture and neutral flavor that pairs well with tangy white wine vinegar and nutty nutritional yeast. When blended together with the other ingredients, it creates a powerful warm, creamy, nutty flavor that is perfect for mozzarella. Cashew cheese ingredients in blender. 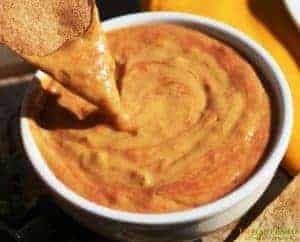 Simply pour the blended vegan cashew cheese ingredients into a sauce pan slowly heating and whisking together as it warms. First whisk and then stir until it gets thick and gooey. The ingredients thicken up in the pan during cooking. 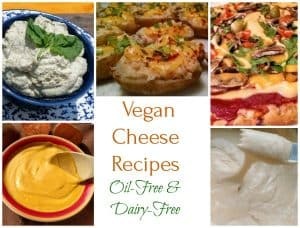 At this point, the cheese is ready to be used in other recipes like grilled cheese sandwiches, lasagna, quesadillas, veggie pizza, no-meat balls, or anything else that comes to mind. 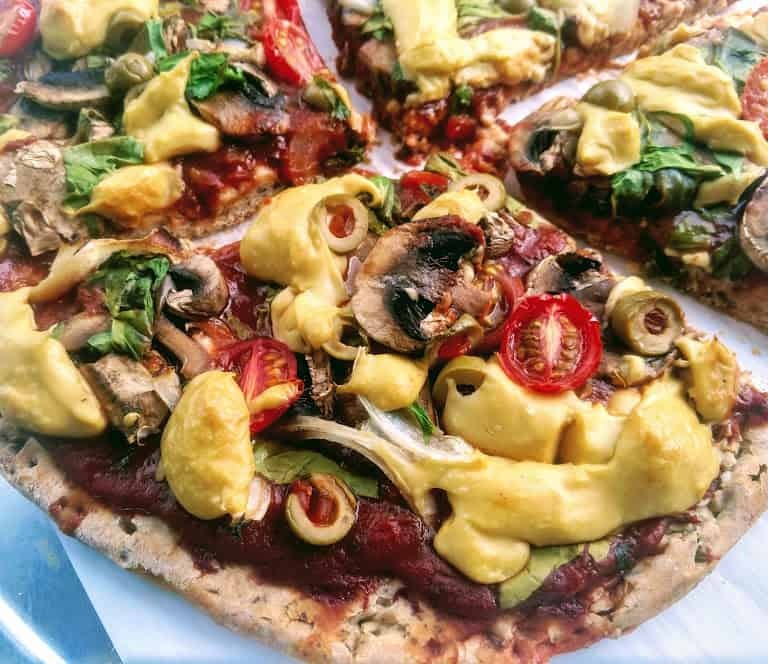 Click for vegan pizza recipe. 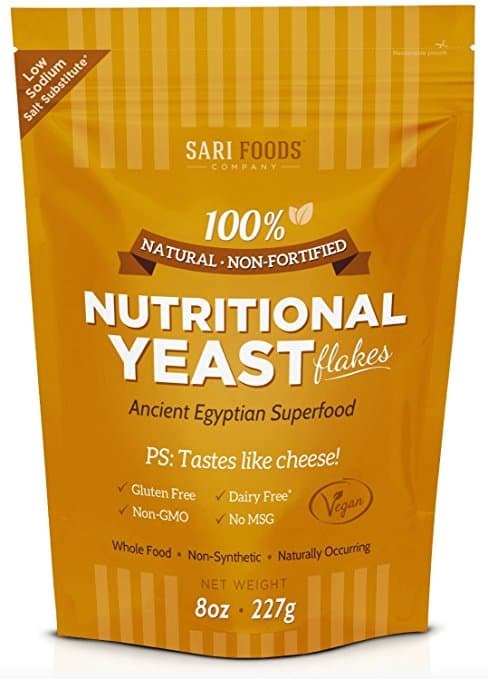 This Cashew Vegan Cheese Mozzarella is fabulous on cashew cheese pizza, lasagna, quesadillas, and anything else you can think of. With a warm and nutty flavor, it even stretches! Soak cashews in very hot water for 1 hour or overnight or at least 6 hours in cool water. Drain thoroughly. Note: I have also made this without soaking the cashews, but the texture and flavor are better it they are soaked. Make mozzarella topping by adding all ingredients to a blender and blend on high until smooth, approximately 2-3 minutes. 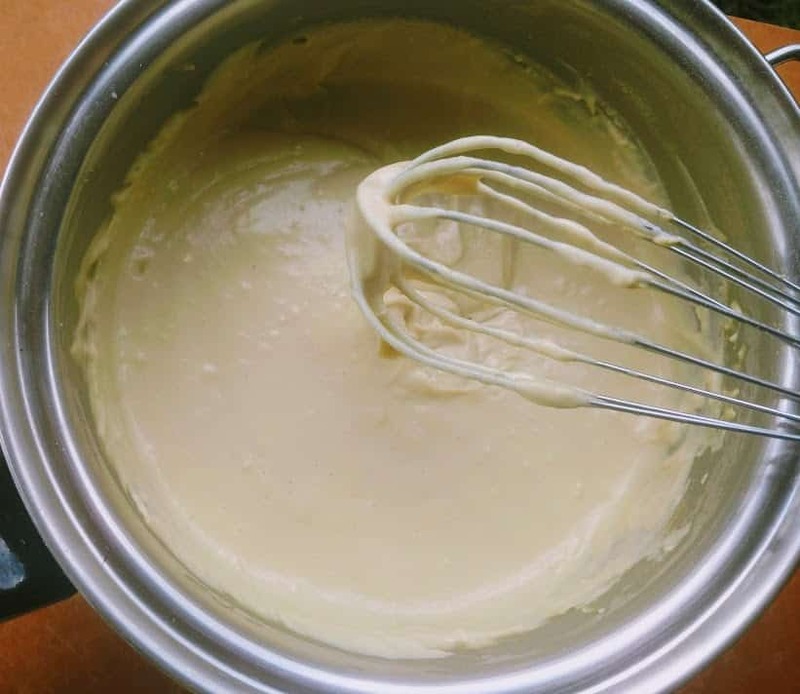 Pour mixture into a sauce pan over medium heat and whisk continuously while cooking. It will become thick and stretchy in 3-5 minutes and be ready to use in other recipes. I’m wondering if you have tried freezing this and then grading it, which would make it easier to sprinkle on pizza? It’s a brand new recipe, so I haven’t tried that yet. Sounds like a great idea, and I would love to hear how it does if you give it a try. 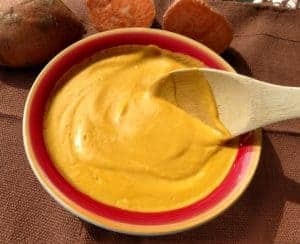 I usually make my cheese sauce (we call fa-cheesy, say it in an Italian way!) with cannellini beans. I have heart disease so I stay away from nuts. Would that work as a replacement for the cashews? 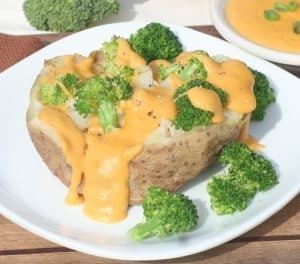 I have substituted white beans for cashews in a number of other recipes, including my regular cheddar ‘cheese’ sauce. I think it would certainly be worth giving a try with this one. I would love to hear how it turns out for you. Thank! okeedoke! when I get a chance, I will try this and let you know what happens….thanks for the input! I love this cheese it’s perfect! You have really outdone yourself with this one! I have made some other cheesy recipes which were pretty good, but I love the creamy stretchy mouth feel to this one. 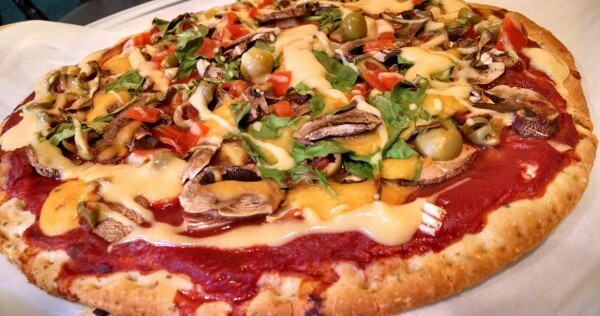 Great on whole grain pizza with lots of veggies added, of course. Thanks for your very creative work! Does it have to be white wine vinegar? I dont think it is available where I live…. Joanna, I think it would be just fine in another type of vinegar. I say give it try! The 3/4 c. water is added to the blender. 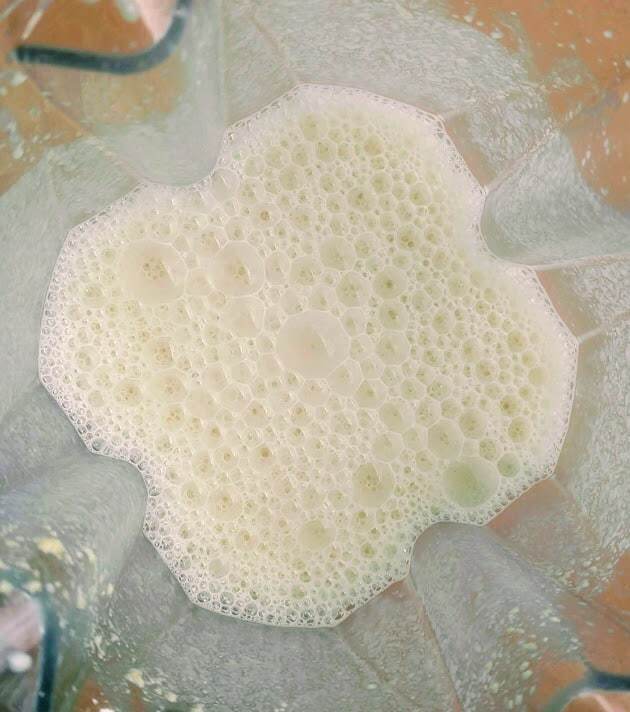 To be honest, I often don’t even soak the cashews, because my Vitamix blends them into a creamy smooth texture. However, soaking does add even more texture (especially for those with lower powered blenders) and flavor. Hope you enjoy the recipe! 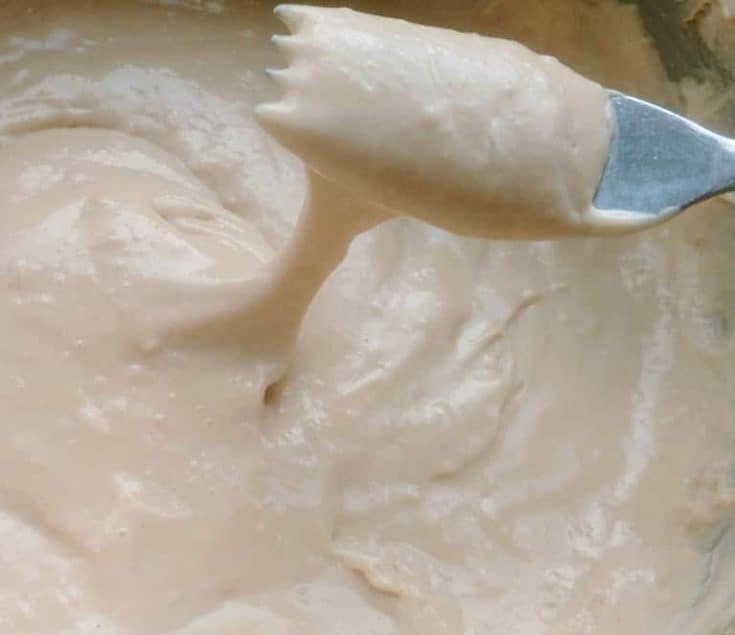 I have some fresh rejuvelac that I made for another recipe and wonder if that could be a sub for the liquid? 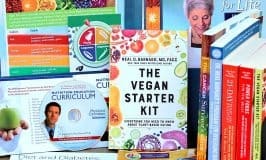 I have not tried rejuvelac before but am interested how it turns out, if you use it in this recipe.